Mira Costa High surf team standout Charlotte Sabina was introduced to film director Bill Kiely by Dennis Jarvis, owner of Spyder Surf Shop. Kiely was casting “Age of Summer,” a coming of age movie he wrote with screenwriter Dave Harris. The director and the screenwriter met at a teachers conference night when their kids attended Hermosa View Elementary School. Kiely met Jarvis while filming him shaping a surfboard for a Bud Light commercial. Despite Sabina having no acting experience, Kiely cast her to co-star in his movie opposite veteran actor Percy Hynes White (“The Gifted,” “Cast No Shadow,” “Between”). Kiely saw in the five-foot-six, singer-songwriter, surfer the achingly unattainable love pursuit for White, who plays a Minnesota teen newly arrived in Hermosa Beach. 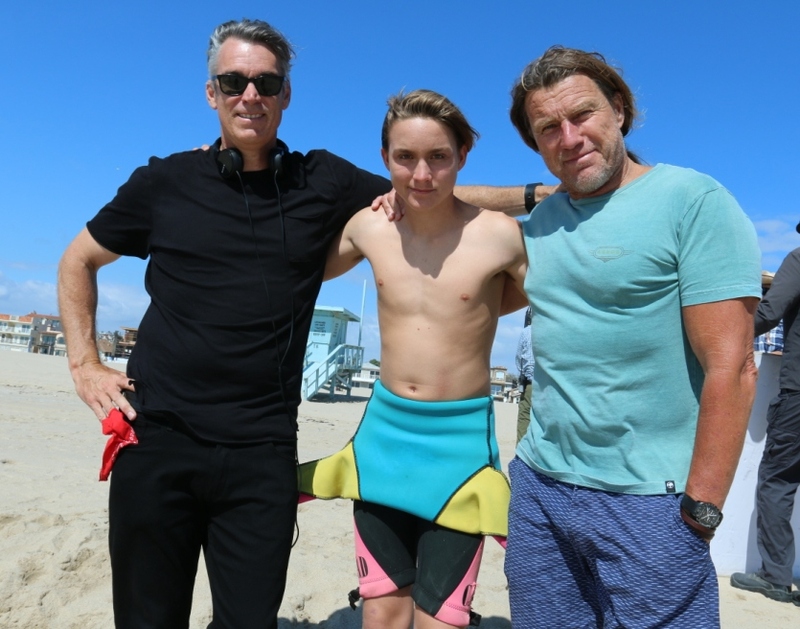 The film is loosely based on Kiely’s junior lifeguard experiences in the mid ‘80s, after he moved to Ventura from Chicago when he was nine. “Age of Summer” premieres tonight, Thursday September. 6 at 6:30 p.m. at the Hermosa Beach Community Theater. The free screening is a thank you from Kiely’s production company Windowseat to the beach community for its support. On Friday the film screens nationwide in select theaters and on iTunes, Amazon and other streaming services. For local beach residents, the screening may resemble a home movie night more than a Hollywood film premiere. Almost all of the actors are local surfers, and almost every scene was shot last summer on the beaches and water out front of Hermosa Beach and Redondo Beach. Even the props and water safety crews are from the South Bay. Jarvis provided the film’s ‘80s era, glass finned surfboards. His daughter, Jamisen, a singer-songwriter like Sabina, appears as a secondary love interest. The lifeguard rescue boards came from the basement of Hermosa Beach building contractor Kent McKeown, screenwriter Harris’ father-in-law. The stunt coordinator was Mark Kubr, a longtime Hermosa resident and 16th Street Hermosa Beach volleyball player. Kiely didn’t know Kubr, but knew of him. Kubr was the head stunt coordinator for “La La Land,” which features one of the most memorable opening scenes in movie history (and also features the Hermosa Lighthouse Cafe and the Hermosa pier). La La’s opening scene shows singers, dancers, skateboarders and BMX bike riders springing from car to car on the gridlocked transition connecting the Harbor and Century freeways. Kubr and director Damien Chazelle worked out the scene using Mattel Hot Wheels. Kubr welcomed the ensuing offer because it meant he could bicycle to work. “I had read in one of the trade publications that the movie was to be filmed entirely at the beach and didn’t believe it because no one does that, because it’s too expensive,” he said. He also enlisted his son Vlade, a South High volleyball player, but it wasn’t another case of Hollywood nepotism. Kubr also enlisted former pro volleyball player and fellow 16th Street four-man player Mark Paaluhi for stunt work. For the junior lifeguard roles, Kieley and Kubr casted local junior lifeguards. “We needed actors who weren’t afraid of the ocean and could surf,” Kubr explained. Among junior guards were Lifeguard Capt. Tom Seth’s daughter Megan, surf photographer Mike Balzer’s son Shane and daughter Malia, former pro surfer Greg Browning’s son Parker and his friend Cody Purcell. Redondo Beach pro longboarder Hudson Ritchie was cast as the alpha male in the clique White is desperate to become a part of. White’s skateboarding stunts were performed by ET Surf Shop-sponsored skater Caedyn Curto, of Redondo Beach. Water safety was managed by Hermosa Beach’s Dave Schaeffer, a licensed boat captain, surfer and retired Los Angeles County firefighter. Schaefer loaded the film crew in his Zodiac for the water scenes, ran actors in and out of the water on his jet ski, and provided water safety. Dive N’ Surf boat captain and surfer Jamie Meistrell helped with water safety while driving the lifeguard boat Baywatch. Moran’s shots of Ritchie on the nose and Sabina pulling into a barrel make the Hermosa pier look like a world class wave. In contrast, his shots of White surfing show how difficult the sport is to learn. For Sabina, “Age of Summer” provides a breakout role. She steals almost every scene she appears in. “I was really nervous because I didn’t have any acting experience. But Bill wanted someone who could surf, so he hired John Markland as my acting coach. You’d think John would want me practicing my lines. But instead, he told me to write a song about my character and practice staring into his eyes so I wouldn’t feel self conscious looking into Percy’s eyes. Percy is a true talent. He helped me feel that what I was doing was natural,” Sabina said. Sabina had the benefit of being able to apply Markland’s method acting lessons to her own junior lifeguard experience. Sabina moved to Manhattan Beach from New York when she was in sixth grade. That summer she became a junior lifeguard.